The Morgane & Merlin are made especially for Celtic, Gaelic and Breton music with its dryer tuning. 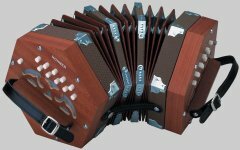 This 2 row button accordion has 21 treble buttons and 8 basses. Both models are identical except the Merlin has 2 extra accidental notes below the second row, which allows for more range. There are 2 sets of reeds in the treble and 4 sets of reeds in the bass. The Morgane is available in the key combinations of BC, while the Merlin is available in GC and AD. Size: 28.5cm x 15.5cm. Weight: 3.3-3.5 kg. The Erica is striking in appearance with its pearl red finish. 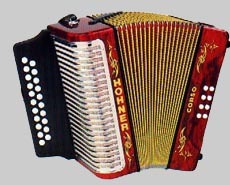 This 2 row accordion has 21 treble buttons and 8 basses. There are 2 sets of reeds in the treble and 4 in the bass. Available in the key combinations of GC, AD and CF. Size: 27.9cm x 27.3cm x 15.2". Weight: 2.72 kg. This popular model is slightly larger in size then the Erica. The Corona II has 31 treble buttons in 3 rows and 12 basses. There are 2 sets of reeds in the treble and 4 in the bass. Has an adjustable bass strap and upgraded bellow straps. Available in the key combinations of GCF, ADG, FBbEb. Size: 31cm x 32cm x 19.7cm. Weight: 4.3 kg. The Panther is one of our best sellers with its satin black finish and chromed grill. 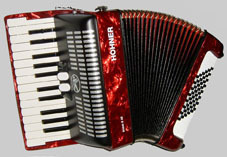 A great accordion for biginners or those looking for value. There are 31 treble buttons in 3 rows and 12 bass buttons; with 2 sets of reeds in the treble and 4 in the bass. Available in the key combination GCF and FBbEb. 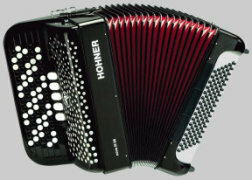 With the success of the Panther, Hohner has introduced a less expensive three row that is now available in the keys of EAD, GCF and FBbEb. There are 31 treble buttons in 3 rows and 12 bass buttons; with 2 sets of reeds on the treble and 4 in the bass. It also comes with a gig bag, shoulder straps and an adjustable bass strap. Similar in appearance to the Compadre on the outside, the El Rey has more in common with the Corona III on the inside. This is due to the three sets of reeds in the treble, which gives it a fuller sound. The key combinations are: ADG, GCF and BbEbAb. It also comes with a gig bag, shoulder straps and an adjustable bass strap. The Vienna is original in its style and design with a black and gold painted finish. 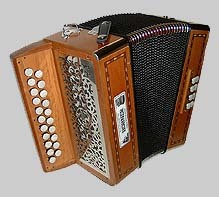 This 2 row accordion has 21 treble buttons and 8 basses. There are 2 sets of reeds in the treble and 4 in the bass. Available in the key combinations of GC. Size: 27.9cm x 27.3cm x 15.2cm. Weight: 3.3 kg. The Double Ray features the Irish style BC chromatic tuning and is fitted with double shoulder brackets. 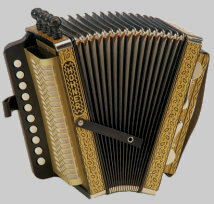 This 2 row button accordion has 21 treble buttons and 8 basses. There are 2 sets of reeds in the treble and 4 in the bass. Available in the key combination of BC only. Size: 27.9cm x 27.3cm x 15.2cm. Weight: 3.3 kg. Slightly larger in size than the Erica, the Corso provides greater volume and tone. This 2 row accordion has 21 treble buttons and 8 basses. There are 3 sets of reeds in the treble and 4 in the bass. Size: 31cm x 32cm x 19.7cm. Weight: 3.6 kg. This model is a Corona II with a whole lot more features. It comes with a double strap bracket, high-end bellow straps, adjustable bass strap, gig bag and a red/black marbled face plate. There are 31 treble buttons in 3 rows and 12 bass buttons; with 2 sets of reeds in the treble and 4 in the bass. Made in Germany. Available in the key combinations of GCF, ADG, FBbEb and EAD. Size: 31cm x 32cm x 19.7cm. Weight: 4.3 kg. 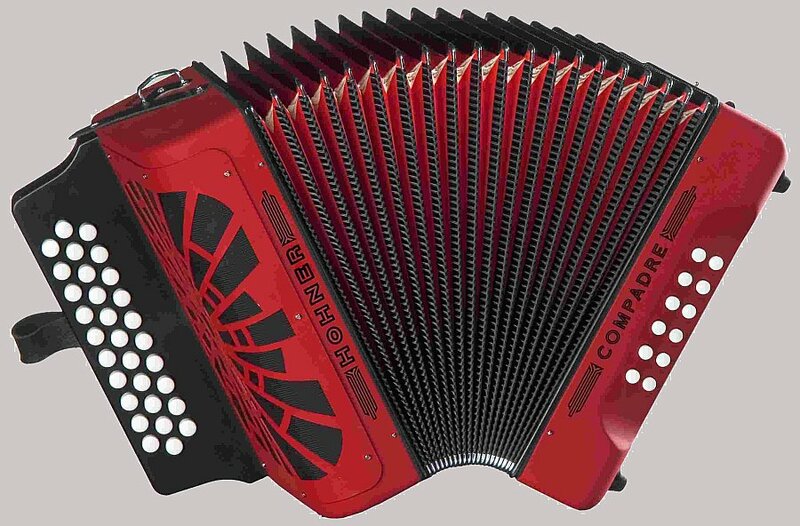 The Corona III has a full sound that will fill any room; with its 3 sets of reeds in the treble and 4 in the bass. There are 31 treble buttons in 3 rows and 12 basses. Comes with one strap. Available in the key combinations of GCF, ADG and BbEbAb. Size: 31cm x 32cm x 19.7cm. Weight: 5.08 kg. 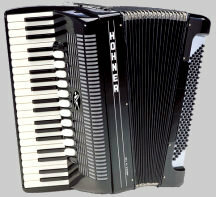 The HA 114 C still maintains the old Hohner look; with its gold and black painted finish, 4 push/pull stoppers and 2 bass spoons. It is ideal for "down east" and "Cajun" style music. 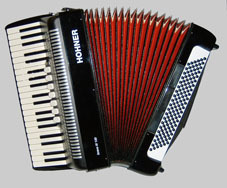 This accordion has 10 treble buttons in a single row; with 4 sets of treble reeds and 2 sets of bass reeds. Available in the key combinations of C or D. Size: 27.9cm x 15.2cm. Weight: 1.59 kg. The D20 has 10 buttons with a single reed on both the treble and bass side. It is available in GC tuning and comes with a soft carrying case. This entry model has an attractive mahogany wood finish. Diatonic system. 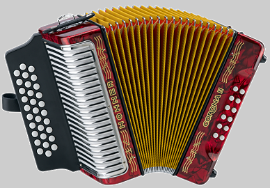 This beautifully designed accordion has 4 treble reeds with 11 registers. In the bass there are 4 sets of reeds with 3 registers. 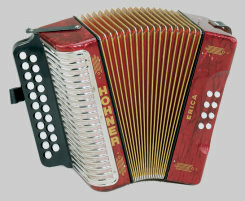 In addition to its excellent tonal characteristics, the Amica is noted for its ergonomic qualities; there are very few 4 voice accordions around which weigh less than 10 kg! Comes with a custom fit Hohner hard case. This is a classic 120 bass accordion with full sized keys, 3 sets of treble reeds and 4 sets of bass reeds. There are 7 treble registers for a great selection of sound and 3 bass registers. 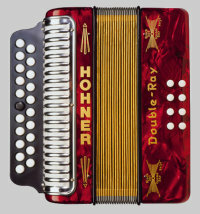 Made with the high quality standards you expect from Hohner. 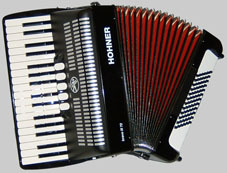 This is an 96 bass accordion with 37 keys, 3 sets of treble reeds and 4 sets of bass reeds. There are 7 treble registers and 3 bass registers. The Bravo III 96 series gives you a wide range of sounds with less weight and cost. This 72 bass accordion has 34 keys, 3 sets of treble reeds and 4 sets of bass reeds. There are 5 trebles registers and 2 bass registers. The new Bravo III 72 is both compact and light weight. 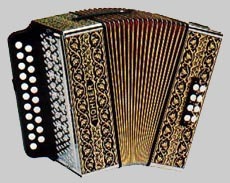 It is ideal for players who would like an accordion to stroll with. It also has a very fast keyboard. 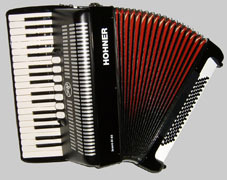 This is Hohner's smallest piano accordion. It has 26 full size treble keys and 48 basses. There are 2 sets of clarinet reeds in the treble and 4 sets of reeds in the bass. 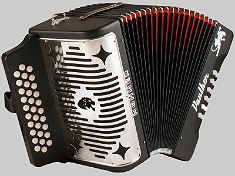 The Bravo II 48 is a standard student model, making it great for those new to the accordion. 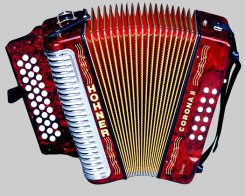 However, it could also be used by the professional who is looking for a light weight accordion, as it provides 7th and diminished chords. The exciting appearance of the Nova series is stamped by the circle hole pattern of the grill; but it serves as more than just a great impression. 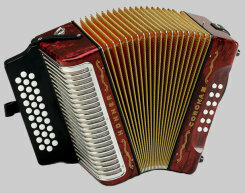 It helps to shape the assertive and unique sound of the accordion by producing a well-balanced mix of low and high frequencies with the precisely placed sound holes. Available in the C system only. © 2019 Musical Instruments of Canada. All Rights Reserved. Designed by Chris De Florio.